Today is day three of heavy rain pelting the thin fabric of our yurt roof. The first day, Drew and I were in town on our first ever night away from Ella together, while Andrea held down the fort at home. Of course the tarp blew off the firewood. And she ran out of propane in the stove. But they stayed warm, and had a lot of fun visiting with friends. 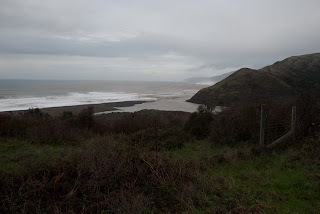 Drew and I came home yesterday to ominous skies, ponding water in low-lying areas, and strong, gale-force beach winds. We stepped out of the car to feel those gusts on our trip home, and couldn't look into the high tide spray foaming up from the beach below the road. It seemed that if we jumped, we might just fly away like a kite. But it wasn't raining. The sky held for several more hours, but then opened up sometime after we went to bed. It's been several years since we had a night like last night in the yurt. Howling winds rattled and shook the yurt, as strongly as when the earth was shaking last week. Only it happened every 20 minutes or so. The rain was always steady-hard, but sometimes so hard Drew and I couldn't hear each other, even though we were right next to each other in bed. Sometimes the hail came down. There was even some thunder and lightening. It felt much like being on a boat, no escape from the elements, even though we were inside. 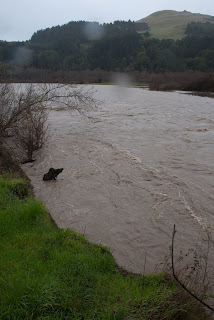 The back of my shoulders crept up and cringed a little, as the rain intensity ramped up. There is a distinct feeling that the roof of the yurt might rip off suddenly, or who knows what else. Like there is some giant and angry but unseen mother-nature monster thrashing about wildly, thoughtlessly swinging her arms around. I kept hoping we would chance to stay out of her way. The strength of it all is mind boggling. And just when you think it can't rain any harder, it opens up the throttle some more, and let's us have it. 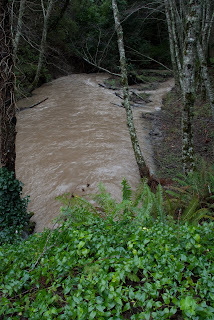 As would be expected, the rivers and creeks are big today, and though the rain let up for a few hours this morning, and we even saw a peek of sun, it is pouring down rain again now. I hear we may have a break this weekend, but for now, it's recurring powerful rains, raising the river stage, and creating much excitement. Though the weather is so intense and potentially destructive your description of it is amazing, thrashing arms of mother nature, I can see her in mind's eye. I just loved reading it though I was concerned for you homesite. Hope you are all well, safe and still dry.